George Jackson was replaced by Mike Butcher as Bandmaster in 1973, which was an important year in the Band’s history. The years prior to this had seen the Band numbers decline from forty-three to thirty, including three Special Constables. After years of attempting to recruit members of the Police Force into the Band, with minimal success, the Commissioner gave permission for more Special Constables to be employed. These Special Constables were all professional musicians and, by the end of 1973, fourteen Special Constables were employed and Band strength was back to forty-two. One hundred and forty one engagements were performed and the future looked much brighter. Police divided their time between the Band – twelve hours, Boys Clubs, – twelve hours and Stations – 16 hours per week. Special Constables were full-time Boys Club instructors and Band members. During 1995 the Police members were transferred from their various stations and all assigned to Twenty Division. This meant that all Band members performed the same duties, namely Band work and Youth Club instruction only. Youth Club tuition was then limited to twice a week, allowing more time to be spent in rehearsal. After several years of rehearsals shared between Redfern Academy and various Youth Clubs, the Band moved to regular leased premises at Sydney Showground. Throughout the late seventies, and early eighties, Band engagements increased to approximately 170 – 180 per year. Membership numbered around forty, with an even balance between Police and Special Constables. However, with the retirement of long serving Police, Band numbers dropped as new Police were still discouraged from joining. Mike Butcher retired in 1982 and was replaced in 1983 by Tom Lambert, the tenth appointed Bandmaster. Rehearsals moved from the Showground to the Sydney Cricket Ground in 1983, then back to Redfern Police Academy in 1985. In 1985, after more than thirty years, the Band ended their direct association with Police Citizens Youth Clubs. This had been building for some time, and there were many reasons for it happening. Due to the varied working hours of the Band, instructors were not always able to attend Youth Clubs, resulting in a decrease of student numbers. Sometimes, Youth Club activities restricted attendance with the Band and many hours overtime were also accrued. These factors resulted in members being solely concerned with Band performance duties for the first time since its inception. During 1986 the Band travelled interstate again, this time to Adelaide for the International Police Tattoo. 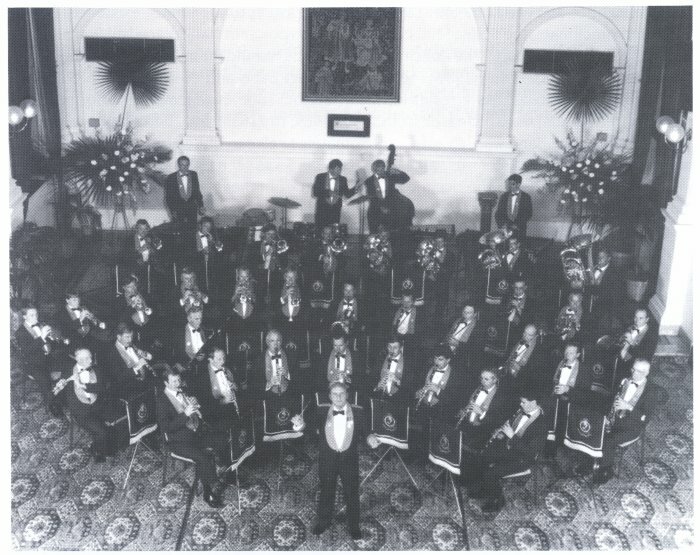 The 1988 Bicentennial saw the Band again perform for royalty and various Heads of State. It was also in this year that they recorded their second LP, “Cops Play Pops”. Tom Lambert retired as conductor, and in 1989, Sergeant Dennis Williams become the eleventh Bandmaster. Mike Hope, Bob Gillespie, George Thompson, Greg Pfeiffer. Hugh Barnwell, Ed Wilson, Merv Knott, John Woodbury, Ian Keuning, John Saunders, Steve Nolan, Mark Holland. Ross McKinlay, Mal Pearce, Dennis Williams. Rod Hunter-Brittain, Ian Cox, Ray Bensted, Bob White, Trevor Marsden, Ken Flannery, Barry Grove-Jones, Darcy Hay, Len Mulley, Des Lynch, John Simensen, Tom Webber. Arthur Hancock, Ray Wills, Glen Murphy. Peter Almond, Ted Bromfield, Ron Davidson, Bill Martin, Paul Blankesteijn, Bill Stojcevski, Laurie Goodfellow, Steve Grove-Jones. The late eighties and early nineties, saw the greatest threat to the Band’s existence. Due to the economic climate, the Police Minister who came to power in 1988, placed all Police Music Units under the microscope. The Police Choir was made redundant in December 1988, as was the Police Pipe Band, in July 1989. The Police Concert Band and even the Mounted Police were fighting for survival. As a result of this attention, total engagements performed (not including rehearsals) were increased from 155 in 1989, to 218 in 1990. Subtracting weekends and leave days, the Band was left with approximately twelve to fifteen full rehearsal days for the entire year! The Minister was satisfied, as the Band was seen by more people, but morale was low and standards on the decline due to the lack of rehearsal and an embargo on any replacements. Fortunately, succeeding Ministers placed more value on the work done by the Band and allowed a more reasonable balance of rehearsal and performance time. In 1993 another milestone in Band history was reached with the recruiting of the first ever female Special Constable. Melissa Telford from Toowoomba, Queensland won the position of solo Bassoon over all applicants. In 1994 Membership currently consisted of eight Police and twenty-eight Special Constables who were all keen to maintain the high standards expected of the State Band of New South Wales and the New South Wales Police Force. supporting approved community activities such as concerts, parades and smaller group functions. The majority of these engagements were performed on a one day basis within an area bounded by the Central Coast, Wollongong, and Katoomba with the exception of overnight visits to Goulburn and Ulladulla.